Real Estate Market Gone Nuts! After 18 years selling residential real estate I thought I had seen it all, or at least most of it. During the spring market this year I received the most offers I have ever received on a listing, 4 times in a row. The first was a 2-family in West Roxbury. Listed at $469,000, we scheduled a public open house for Sunday, and indicated that offers were due the coming Tuesday night. We had 60 people at the open house, received 12 offers, and are scheduled to close soon for well into the mid $500s. The winning bidder had no mortgage contingency. Next was a very cute and somewhat diminutive house in Natick listed at $359,000. It looked great, we had over 50 people come to the open house, received 9 offers, and sold it for $378,000 after deducting a fairly big sum for a failing porch. The third was a very nice, but dated, 2+bd/1 ½ bath condo in Cambridge priced at $549,000. This time we received 8 offers, with the winning bidder willing to pay a bit over $600,000 and no mortgage contingency. The last one was a mint condition 2bd/2 bath condominium in Allston/Brighton with garage parking built in 2007 and priced at $479,00. We only received 5 offers this time and are selling it for around $500,000. If you have read the news or talked to other people in the industry I am sure you know that this kind of thing has been happening all the time and is continuing to happen. So what’s going on? I think there are 2 main reasons for the feeding frenzy of this recent spring market. The first and foremost is low inventory. Take a look at this graph showing the inventory for the condominium market of the Back Bay, South End, and Beacon Hill combined. Other highly desirable neighborhoods around Boston have similar statistics. The decline year over year from 2012 to 2013 reaches as high as about 33%. Going back 2 years, the inventory is down in the range of 45-50%. In short, inventory has been declining for some time. 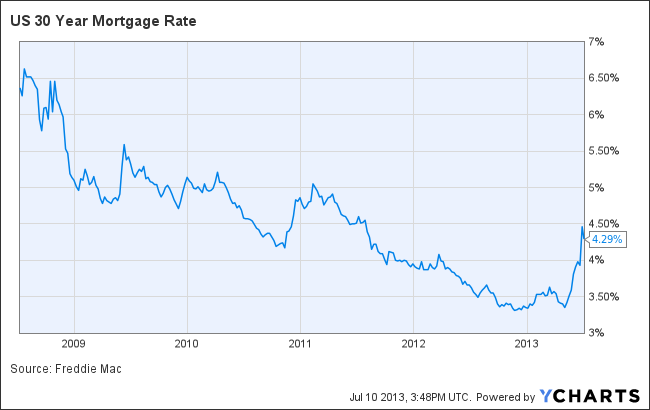 This year interest rates also hit an historical low at the beginning of the year. See below. I think it is fair to conclude that this spring there was the widespread perception that interest rates were probably as low as they would ever go. This made borrowing inexpensive, and naturally increased the impetus for people to want to buy homes. The lowest rates ever, combined with the widespread knowledge that inventory was low, created a perfect storm of high demand and low supply. The result has been the consistent scenario of multiple offers and prices shooting up so widespread this past spring. Now with interest rates going up, it will be interesting to see what happens this summer and fall.